Servicesat is a distributor of satellite connectivity solutions, encompassing everything from small, basic Home User Internet connectivity requirements to designing and deploying major Government and Corporate networks for thousands of users. 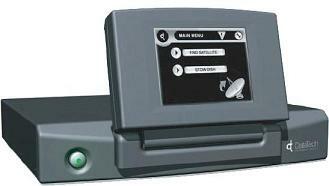 Hughesnet� 7000s is one of the types of the indoor VSAT modems used. Technologies available through Servicesat include Hughes Network Systems, Tachyon Networks, Satlynx and iDirect. As one of the largest Satellite distributors in Europe and the Middle East, Servicesat has over 2000 terminals currently deployed across six different satellites. Dedicated SCPC services are available for internet caf� and big business users. Shared, lower cost, services available to suit home, small office and small business users. 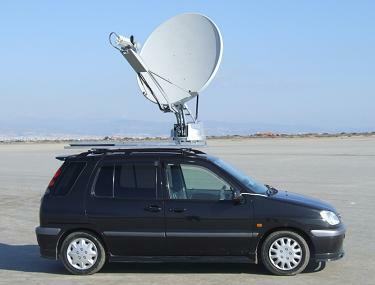 Auto-Deploy self-acquiring satellite system mounted on Toyota vehicle. Servicesat recently released its own "AWARD WINNING" Auto Deploy self-acquiring Satellite system. This is a robust mobile Satellite System that deploys automatically and rapidly with one click connectivity. The antenna works on virtually any satellite internet platform worldwide, delivering LOW COST real time IP, voice, audio and data communications in the most remote places. using the Eutelsat W1 satellite at 10 east orbit longitude. More than 70% of the available satellite technologies have been tested by Servicesat and only those products which meet specific quality criteria are offered to our customers. Using products and services from this selected range, they recommend services or create custom-built solutions to suit your needs and future requirements. Servicesat uses its vast experience in the satellite industry to assist its clients in integrating a wide range of peripheral services including VoIP (Voice over Internet Protocol), Hotel Systems, Apartment Block Solutions, Community Solutions and Wireless Networking. 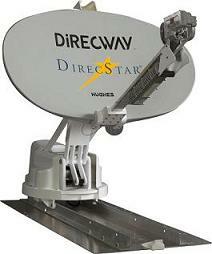 Antenna controller with screen display showing: "Find Satellite" and "Stow dish"
Some of the text and the images are with permission, derived from material kindly provided by ServiceSat.